Iran's oil production and exports have slumped after the U.S. reinstated sanctions last year, and new curbs are set to further restrict its exports. Exemptions for importing countries including Japan, China, Turkey, India and South Korea have partially cushioned the blow. With foreign investors steering clear of the world's fourth-largest holder of crude, it's trying via the Iran Energy Exchange to offload some oil to domestic buyers. Sales have been dismal, and even Iranian oil officials concede that the physical contracts are undesirable as long as oil sanctions remain intact. "We knew from the beginning that it was almost impossible to sell oil" on the exchange, Morteza Behrouzifar, deputy head of the Iranian Association for Energy Economics, said in an interview. "Iran's crude is sanctioned and under no circumstances can anyone buy Iranian crude except those who were granted waivers." 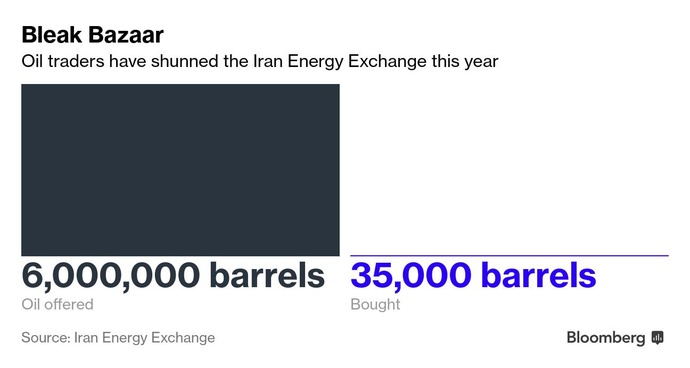 Iran has tried to sell oil on its exchange in the past. The first offerings in 2011 weren't successful, and another effort to sell just under three thousand barrels in 2014 wasn't received well by potential buyers, state-run Islamic Republic News Agency reported last week. The exchange is offering another million barrels of light crude for a 6 percent down payment and 90 days of credit this week. But it's up to the buyer to line up the tanker and insurance needed to transport the fuel to the ultimate user. "Those who have waivers go directly to the National Iranian Oil Co. They don't need to participate in the bourse," Behrouzifar said. "It's pretty immature to think of the energy exchange as a way to get around sanctions."